Measurement Computing USB (DAQ) data acquisition boards and modules are available with analog input and output, digital I/O, and counter / timers. Temperature measurement devices include thermocouple, RTD, or thermistor inputs. Software and drivers for C++, Visual Basic, LabVIEW, and DASYLab are included. 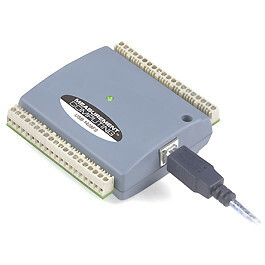 USB gebaseerde, 1 MS/s, 16-bit multifunctionele module met 16 differentiële 16-bit analoge BNC ingangen, meerdere bereiken, 16 digitale I/O-lijnen, 4 counter-ingangen en 2 timer-uitgangen. USB gebaseerde DAQ modules met 32 differentiële of 64 single- ended analoge ingangen met 16 bit-bit resolutie van 40-pin connecters.